What are buckets? 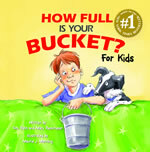 This year we are following the "How Full is your Bucket?" philosophy. First, we must do our best to keep from dipping from others' buckets. If our "bucket" is full we are more productive and positive. It is important to fill each others' buckets through positive interactions and words. Doing so will fill our own buckets as well. Click on the book for a website that helps further explain the "How Full is your Bucket" philosophy.